Who'll read your weblog when you die? I just realized that people I knew who had websites and who died, and who's websites STILL are up, seem, well... less dead. My referer logs still show quite a few people coming from Sasha Chislenko's Great Thinkers and Visionaries page. Which is still excellent, and I'm glad somebody is keeping it up in his memory. And somehow he doesn't quite feel gone, because his website is still up. Nicholas Albery died suddenly too, but the Global Ideas Bank is still continuing as before in other people's capable hands, and is still on my server. But somehow, because our relationship was virtual, I wouldn't be terribly surprised if I suddenly got an e-mail from Nicholas. Another dear friend with a site on my server, Diane Dornbusch, is also no longer with us. And I haven't even cancelled these people's accounts on NCN or anything, because I didn't know what to do with them. Their accomplishments still stand, their websites are still up. You just can't send them e-mail. When I die, I'd certainly want to continue existing in cyberspace. But now, my point is, a weblog is not necessarily a good format to exist in, if you aren't updating it any longer. It is not a very eternal format. It deserves to be preserved as a historical resource, but if not seen in relation to fresh material, it gets to look dated really quickly. So, if the material in a weblog could flow, not only into a chronological and categorized and indexed archive, but into something like a mind map. Maybe not all of it, and maybe not looking the same, but I want something that allows me to fill out a mind map of what I'm about and what I've learned, in the same breath I use for posting in my log. It needs to feel integrated, but it would flow into two very different presentation formats. And one of them will be of more eternal value than the other. Maybe, if I will no longer be posting live material, somebody can flick a switch, and it is a different view that is presented as the front to my weblog. Instant Memorial Library, rather than Faded Newspaper of Last Year. A very appropriate message on behalf of the United States of America, to explain and apologize about what has been going on. Great animation. Must see. Jason Eric Smith, a future high school history teacher, was scammed out of his $3000 Apple Powerbook on eBay. But Jason didn't just take it lying down, even though the police pretty much told him to forget about it. Read the great tale about how he involved the whole Mac community, went to great lengths to track down the guy, got good help from a number of people, and with much trouble found a law enforcement person who was willing to act on it, and the guy was arrested, and charged with a whole series of crimes. A story about the power of a network of good people, and a good read at that. "being completely involved in an activity for its own sake. The ego falls away. Time flies. Every action, movement, and thought follows inevitably from the previous one, like playing jazz. 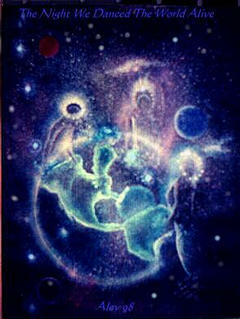 Your whole being is involved, and you're using your skills to the utmost." The guy was obviously crazy, but he had vision and he had guts, and he followed his dream and did something nobody else had done. That makes him a hero in my book. When Larry Walters was 13 years old, he went to a local Army-Navy surplus store and saw the weather balloons hanging from the ceiling. It was then he knew that some day he would be carried aloft by such balloons. This obsession would be with him for the next 20 years. 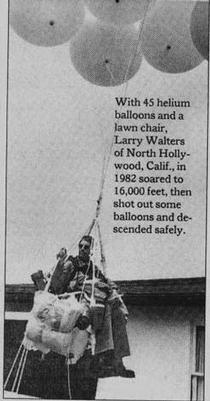 On July 2nd, 1982, Larry tied 42 helium-filled balloons to a Sears lawn chair in the backyard of his girlfriend's house in San Pedro, California. With the help of his ground crew, Larry then secured himself into the lawn chair which was anchored to the bumper of a friend's car by two nylon tethers. He took with him many supplies, including a BB gun to shoot out the balloons when he was ready to descend. His goal was to sail across the desert and hopefully make it to the Rocky Mountains in a few days. But things didn't quite work out for Larry. After his crew purposely cut the first tether, the second one also snapped which shot Larry into the LA sky at over 1,000 feet per minute. So fast was his ascent that he lost his glasses. He then climbed to over 16,000 feet. For several hours he drifted in the cold air near the LA and Long Beach airports. A TWA pilot first spotted Larry and radioed the tower that he was passing a guy in a lawn chair at 16,000! Larry started shooting out a few balloons to start his descent but had accidentally dropped it. He eventually landed in a Long Beach neighborhood. Although he was entangled in some power lines, he was uninjured. From Mark Berry who has made it his hobby to be obsessed with the story.